Been working on this design for last couple weeks. 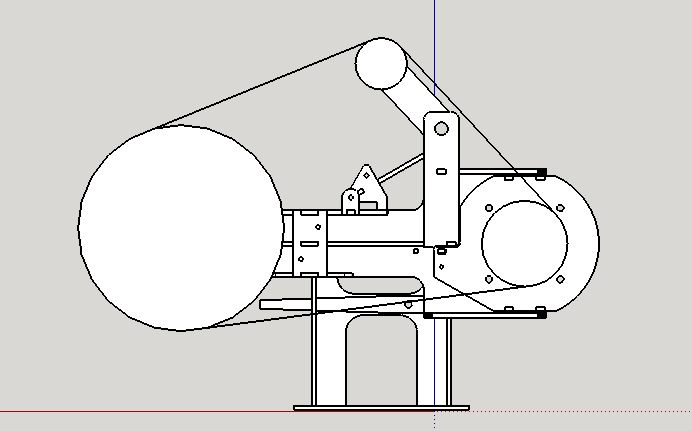 I'm hoping for some opinions on the design, like if theres anything I should change, design flaws, etc... You'll have to use some imaginative license as I didn't draw any tool arms or wheels, besides the mock up to make sure the geometry would work. The mock up wheels are 12" contact, 5" drive, 3" idler. spazola, Geezer, sharptonn and 4 others like this. -Zak Jarvis. Writer. Artist. Bon vivant. Looks good John. I'm not undderstanding what the triangle and lever arm above the tool arm receiver is. Does this lock the tool arm? 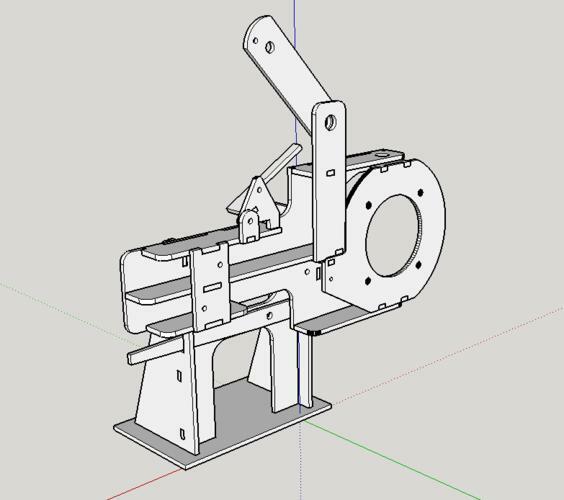 I was thinking about doing the whole ratcheting deal from the TW but got to thinking, I have a couple of 40lb gas struts laying around so I made a cam. 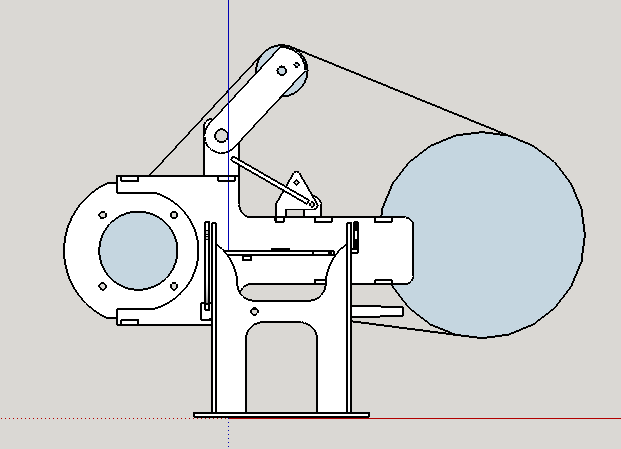 I figure I can set tension by pulling the tooling arm tight against the belt then pushing it back a little then use the cam by just flipping the arm on it. Once I have the distance set for a wheel I’m thinking belt changes will just be a matter of letting off the cam then switching belts and flipping the cam back over. The cam is in the tensioned position in the renderings, pull that arm forward for off. 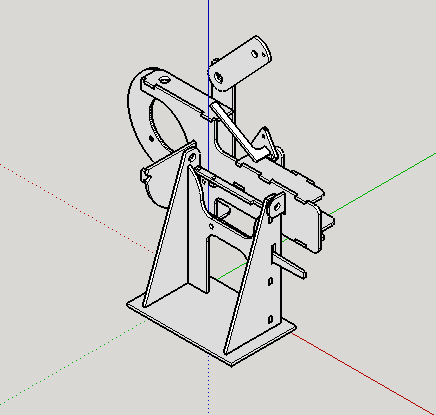 I'm still not seeing it, but that's OK. 1/4" does seem a bit flimsy for the idler arm. The ratchet deal on the TW grinder allowed the tool arm to be set at a given distance independent of wheel sizes, but I didn't see the advantage of it. I see that you are tracking at the drive wheel. If you could get the pivots out closer to center of the drive wheel it will effect your tension less as you track. I don't know how important that will be in use though. sharptonn and Voidmonster like this. 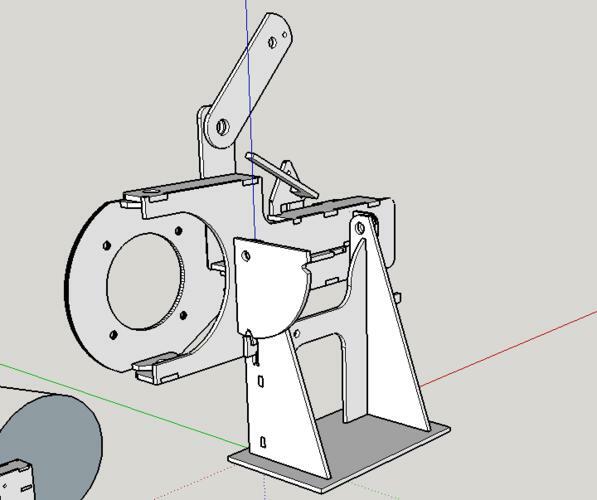 Good thinking, I’ll play around some and see what I can do, maybe I’ll revisit the ratcheting thing or at least try and get some more adjustability so that small wheels are sticking out a crazy amount. The whole drawing gives me the impression of being flimsy but I think that is my first impression. The 3 pivot points are what I see as a possible issue. 1/4 wide isn't that large of a bearing surface. 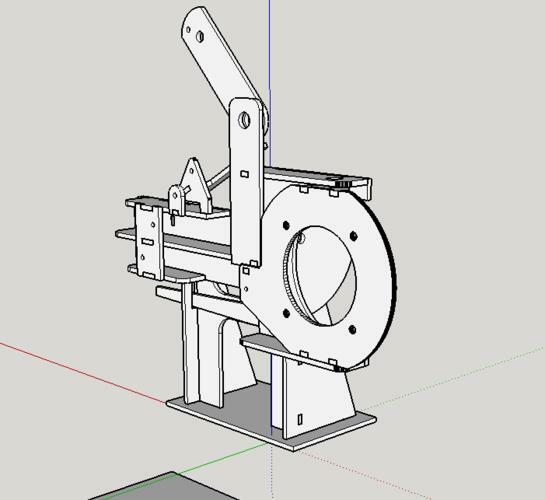 What if for example you made 2 idler arms of the dimensions that you show and put one on each side of the upright? That would roughly give you 3/4" or more of thickness to prevent twisting of the shafts or pins. I think I could word this much better but do you see my thoughts? I don't really see a problem with the wheels sticking out. Look at it this way. If the drive wheel and contact wheel had zero dimension, they would only be 3' apart. 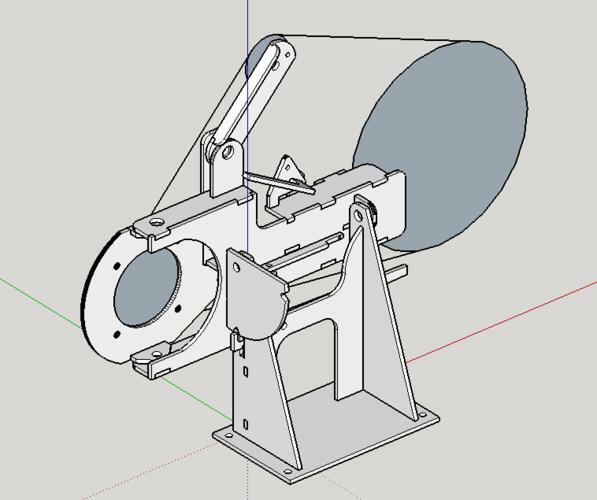 Add a tension wheel that is at a distance in another direction and some diameter to the drive wheel and they are a lot closer. 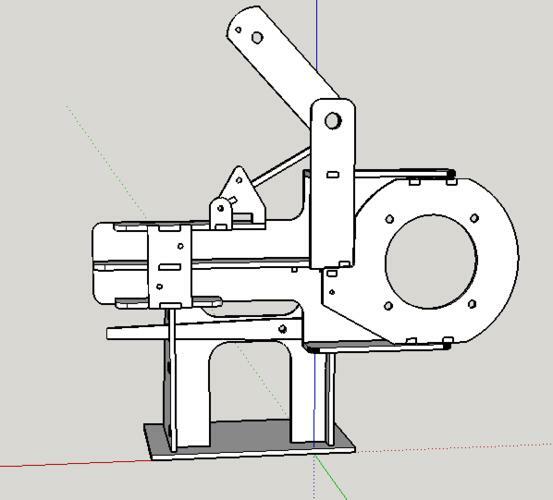 Did a little tweaking to the idler arm and idler pivot point. 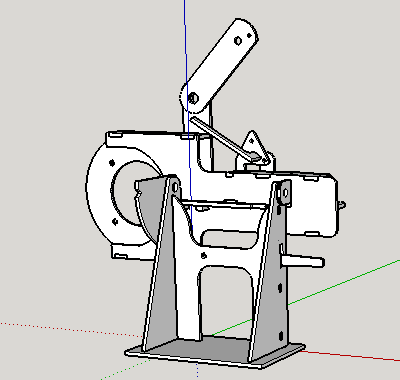 Does the stiffening piece added to the arm make sense or should I abandon that and just go to 3/8 cold roll?